Not only are these pancakes heart-healthy and delicious, but they don’t weigh you down like regular pancakes tend to do. 1) Mix oats and buttermilk together in bowl until blended. Place in refrigerator overnight. 2) The morning of your breakfast, add all ingredients together with oat mixture and blend. You may need to add a splash of buttermilk if it is a little thick. 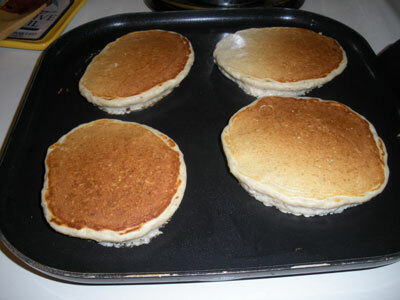 4) Flip pancake and cook other side. Both sides should be golden brown. Tastes great served with a fruit sauce. I served them with a blackberry, blueberry sauce. This sauce is packed full of antioxidants and contains very little sugar. It’s very good for you and tastes great! 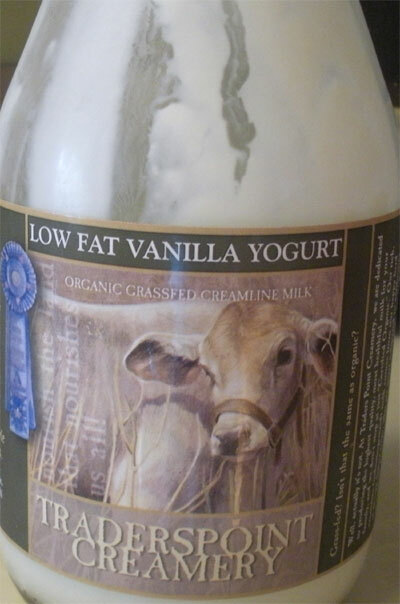 Try it with oatmeal pancakes or frozen vanilla yogurt. You can use a regular bread pan for this recipe if you like. By using the 9” X 12” pan, it takes about 30 minutes less cooking time. Pack a square in your lunch for the mid-morning munchies. 1) Blend pumpkin, eggs and canola oil together using a beater or whisk. Add in sugar and beat to well blended. 2) In a separate bowl, mix together flour and spices. 3) Gradually add the flour mixture into the pumpkin mixture and beat well. 4) Stir in the chopped pecans and raisins (if desired). 5) Grease 9” X 12” pan with canola oil to keep the bread from sticking. Pour batter into greased pan and spread evenly. 6) Bake at 325 degrees for about 30 minutes or until knife inserted in center comes out clean. 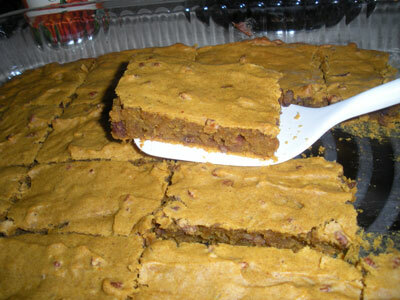 7) Cut into squares and serve. Makes about 12 squares (depending on how you cut them). Adding this oatmeal to your diet will be an easy resolution to keep. 1) Add oatmeal and soy milk to medium-sized kettle and bring to quick boil. Then reduce heat to low and stir and cook another couple of minutes. 2) Add honey and flax seeds and stir. 3) Remove from heat and stir in remaining ingredients. This smoothie is delicious and so good for you. If you take it to work, it will be gone before you get out of your car. 1) Put all ingredients in a blender and blend until smooth. 2) Pour into a tall glass. 2) In a small bowl, combine sugar, flour, and cinnamon. Cut in two tablespoons of Smart Balance until the mix is crumbled. If you don't have a tool to cut in the butter you can use a fork. 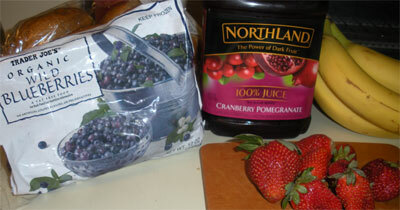 3) Prepare the batter according to package directions except do not fold in blueberries. 5) Bake at 400 degrees for 25 minutes or until golden brown on top. This shake tastes like Banana pudding. 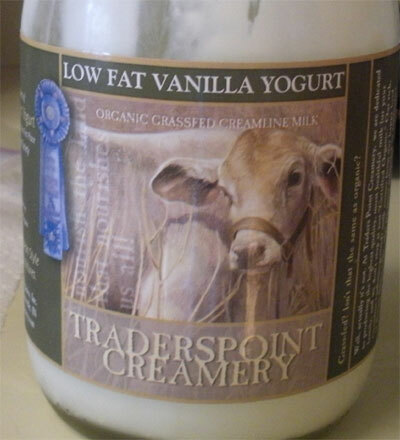 Deliciously smooth and rich, but low-fat and healthy. Whip one up and pour it in a to-go cup when you are in a hurry. 1) Cut one banana into chunks and freeze (at least an hour before preparation). 2) Add all ingredients to blender and blend until frothy. 3) Pour into large glass. Delicious and healthy way to start the weekend. 1) Mix together first 5 ingredients with wire whisk. 2) Heat oil in omelette pan or small sauce pan on medium heat. Add onions and sauté a couple of minutes. Add peppers and sauté a few more minutes until vegetables are tender. 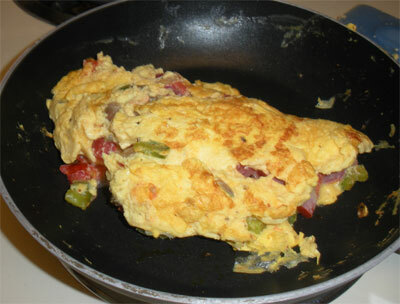 3) Pour omelet mixture into pan with vegetables. Using spatula, lift edges of omelet while it’s cooking, allowing uncooked egg mixture to flow out so that omelet will cook evenly. Continue cooking until egg is set. 4) Add cheese, if desired. 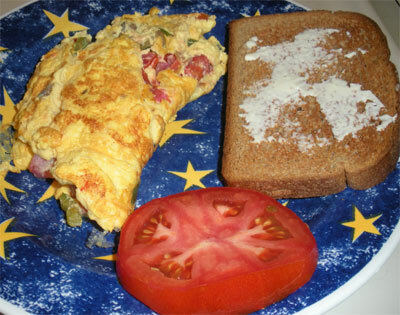 Flip one half of omelet over the other half. It should be browned nicely on the bottom. 5) Serve with toast, veg sausage, fruit or hash browns. If you are looking for something different, healthy, delicious, and quick to make for breakfast, Ted's Wednesday Breakfast is it. 1) Pour half the yogurt in two bowls. 2) Sprinkle half the uncooked oatmeal and half the fruit into each bowl. This frittata is popular in Spain. They cut it into small slices and eat it as a tapa, cut it into large pieces and eat in on bread as a sandwich, or eat it plain as the main course in a meal. 1) Cook the potato in the microwave for about 3-4 minutes. Peel potato and cut into large chunks. 2) In medium saucepan, sauté onion in cooking oil on medium-high heat for about 5-8 minutes or until carmelized. Add potato chunks and stir. 3) In a medium bowl, beat eggs. Beat in milk and salt and pepper. 4) Arrange onion and potato evenly in pan. Pour egg mixture into pan. Cook on medium heat about 5 minutes. Add grated cheese, if desired. 5) Place pan into pre-heated oven and bake for 15 minutes or until set and golden brown on top. Who doesn’t love French Toast for breakfast? 1) Grease a large flat skillet and preheat on medium heat. 2) Whisk all ingredients together (except bread). 3) Dip each side of the bread in the egg mixture. 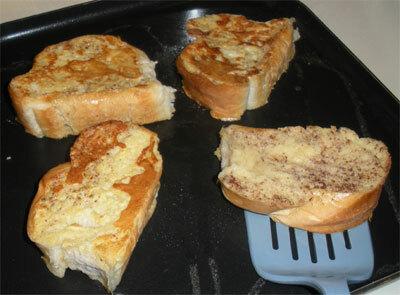 Place each slice of bread in the preheated skillet. Cook for about 6 or 7 minutes on one side or until golden brown. Flip and cook the other side. 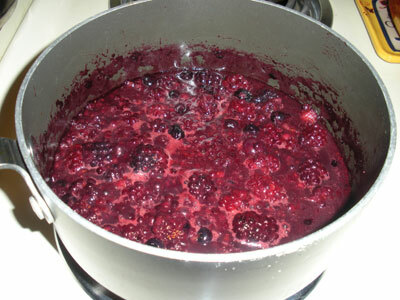 Delicious with syrup and/or berries. These little quiche are sure to be the hit of your Summer brunch or shower. Much better than the pre-made frozen ones at the grocery store! 1) Combine butter, cream cheese, flour and salt in mixing bowl until well blended. 2) Break of small pieces of dough with your fingers and press into miniature muffin cups. Bake at 350 degrees for 3 to 5 minutes. 3) Saute chopped onion in olive oil until transparent. 4) Add 1 tsp of shredded Swiss cheese into each partially cooked crust. 5) Beat eggs, milk and seasonings together. Combine with onions. 6) Pour into shell over cheese until about 2/3 full. 7) Bake at 350 degrees for 20 to 25 minutes or until golden on top. Makes 60 tarts. May be frozen. Yummy casserole is perfect for Sunday morning. 1) Sauté onion on medium heat in olive oil until translucent (about 2 minutes). 2) Add shredded potatoes. Let cook about 2-3 minutes. Flip with spatula and cook other side 2-3 minutes as well. 3) Add potato onion mixture to bottom of two mini-casserole dishes, and top with half the shredded cheese. 4) Put baby spinach in hot skillet (that potatoes were in) and cook until it starts to wilt. 5) Add spinach to casserole dishes. 6) Add eggs to the hot skillet and cook just until the white starts to set. Put two eggs in each of the mini casserole dishes. Top with remaining cheese. This casserole will fuel your family well before a day playing in the snow! Loaded with veggies and protein. 1) Spray 9 X 12 casserole dish with non-stick cooking spray. 3) In large bowl, beat eggs with milk, Dijon mustard, salt and pepper. 4) Cut bread into diagonal slices. Layer half of the bread slices in the bottom of the pan. Then add a layer of ½ of the vegetables, and ½ of the cheese. 5) Add another layer with the remaining bread slices and then the remaining vegetables. 6) Pour the egg mixture over the bread and veggies. 7) Top with remaining cheese. 8) Place into cold oven. Then turn oven on to 350 degrees. Leave in oven for about an hour and 10 minutes. When knife stuck in casserole comes out clean and top is bubbly and brown, it’s done. This is a fun recipe to make with kids. 1) In large, deep saucepan, heat oil on medium high heat. 2) Using a small, round cookie cutter, cut a small hole in the center of each biscuit. 3) Fry the donuts and the holes in the hot oil a few minutes on each side until light, golden brown. 4) Place on paper towel to drain and cool. 5) Stir together cinnamon and sugar and put into large Ziploc bag. Add slightly cooled donuts and shake. Serve. 1) In small saucepan, add three egg yolks, water and lemon juice. Cook over very low heat, stirring continuously. 2) Slowly add the pieces of butter and continue stirring until all butter is melted into sauce. 3) Toast English muffins and poach four eggs. 4) In medium saucepan, heat olive oil on medium heat. Add garlic and sauté a minute. Add spinach and sauté another minute, until just wilted. 5) Place each split English muffin on a plate and top each half with ¼ the spinach mixture. Add one poached egg to each half and then ¼ of the sauce. 6) Serve with fresh fruit or hash browns. If you like a tart smoothie, try the first way. If you like a creamy smoothie, try the second way. Either way, it’s healthy and delicious. If you have kids around, give them the ingredients and let them make their own. Treat your mom to a frittata this Mother’s Day or any day. This recipe calls for broccoli and mushrooms but it is easy to make with whatever veggies you have in your fridge. 1) Beat eggs with wire wisk in medium sized bowl. Add milk and salt and pepper. 2) In medium-sized skillet on medium-high heat, add olive oil and onion. Saute about 5 minutes until onion is caramelized. Add broccoli and sauté about 5 minutes more until broccoli is tender. Add mushrooms and sauté another minute. 3) Spread veggies out relatively evenly in skillet. Pour egg mixture over veggies and leave it for 3 or 4 minutes. Gently lift the edges as it cooks to allow liquid center to go out to the edges, as the edges cook first. 4) Add cheese to top of frittata and place entire skillet into preheated oven. Bake for 15-20 minutes at 375 degrees until puffy and top begins to turn golden brown. 5) Remove from oven and serve. Be careful and don’t forget that the handle to the skillet will be very hot for a while. Serve with muffins or toast and fresh fruit. Breakfast for two.